Over five years after the global financial crisis, jobs are still scarcer than they used to be in the United States – but not everywhere! In true American spirit, for example, thousands of people looking for jobs – or better-paying jobs – have been trekking north and west to “men camps” in rugged states like North Dakota and Wyoming in the last few years, to benefit from the sudden (and perhaps short-lived) oil and gas boom there. But what about registered nurses (RNs)? The increased population in places like Williston, ND, means more nursing professionals are needed there too. Boom towns like that might offer opportunities for travel nursing in particular. But before you pack your catheters and snowboots and head for that part of the country’s 6°F February nights, you might want to look into other opportunities – because the good news is that nursing jobs are a growing occupation nationally. Reason enough to venture beyond familiar territory! Of all the occupations and industries, those related to health care are projected to add the most new jobs between 2012 and 2022, the U.S. Bureau of Labor Statistics declared just over a year ago. While total employment in the country is projected to increase by 10.8%, employment in the health care and social assistance sector is set to grow by 29.4%, accounting for almost a third of the total projected increase in jobs. The government’s “national employment matrix” distinguishes between two main categories, “healthcare practitioners and technical occupations”, which will grow by 21.5%, and “healthcare support occupations”, which will increase by 28.1%. Of all the major occupational groups, those are the two with the highest growth rates! Of the 30 individual occupations with the largest projected growth rates, no fewer than 14 are related to health care. 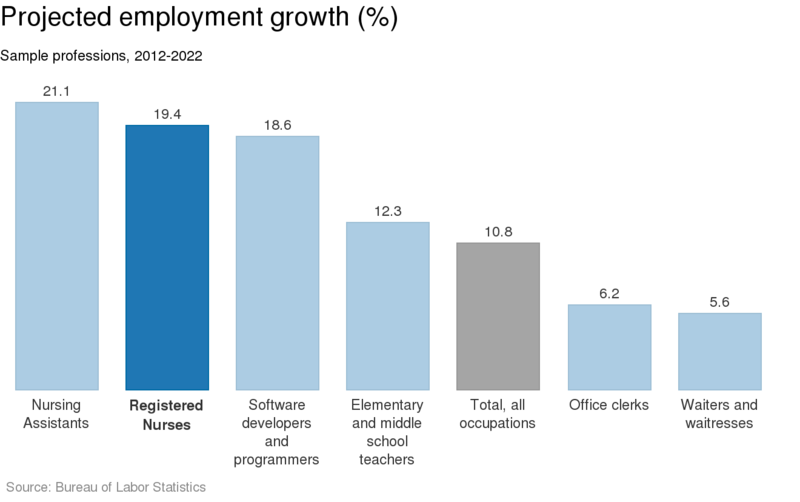 The growth in jobs specifically for Registered Nurses is a little less heady but still set at a healthy 19.4%. The economic recession dented the demand for nurses somewhat, but nurses will be among the first to benefit from the economic recovery, because that projected growth rate is almost twice that of employment overall. Such projections have led to prediction of as much as 285,000 unfilled RN positions by 2020. Where are the most jobs for Registered Nurses? Where are they most concentrated compared to the labour market overall? Where will they be needing more and more RNs at the steepest rate? The number of licensed practical and licensed vocational nurses will be growing at an even faster rate (24.8% between 2012 and 2022), with growth reaching up to or over 30% in Utah and Arizona. Other health care-related professions that offer a rapidly increasing number of jobs include home health aides, physical therapists and physical therapist assistants; physician assistants, medical secretaries, and nursing instructors and teachers at a postsecondary level. Over the next seven years or so, there will be jobs for 70 of you on the Virgin Islands. What about the rest of you? That’s right: employment for Registered Nurses on the U.S. Virgin Islands will grow by a heady 21.8% between 2012 and 2022, according to employment projections from the U.S. Bureau of Labor Statistics. But that’s starting at a level of just 200 Registered Nurses working there in 2012. Even when you add in the number of RNs needed to replace people leaving the occupation, that only adds up to ten job openings a year. The good news is that in the United States overall, the Bureau of Labor Statistics has projected some 105 thousand job openings for RNs every year until 2022. And most of them will be needed where the most people live: Texas, California and Florida (which passed New York as the third most populous state last year). 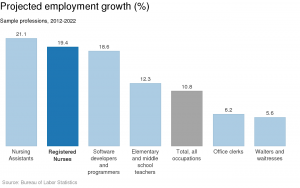 The most recent data about how many Americans work in which jobs are from May 2013, courtesy of the Occupational Employment Statistics from the Bureau of Labor Statistics. The make-up of those numbers diverge slightly from those used in the Bureau’s employment projections for 2012-2022, but the difference is minor. Together, the states in this Top 10 contain just over half (51%) of America’s working Registered Nurses. But wait, you might say — this looks suspiciously like the Top 10 of most populous states, period. You wouldn’t be wholly wrong. In fact, the same states contain about 53% of the entire U.S. population. Just compare this population map of the U.S. The only differences are that Illinois ranks two places lower in this list, Georgia is missing, and Massachusetts is only the 14th most populous state. Where is the highest concentration of Registered Nurses compared to the labour market overall? In the United States overall, two out of every hundred employed persons is a Registered Nurse. 2.01%, to be exact. They’re fairly evenly spread across states and cities. It’s not like with heavy truck drivers, who make up an impressive 3.6% of the working population in North Dakota and just 0.6% in the state of New York, or “operating engineers and other construction equipment operators”, who make up 2.1% of the employed of Wyoming and just 0.1% in New Jersey. Still, there are some differences. In the United States overall, two out of every hundred employed persons is a Registered Nurse. 2.01%, to be exact. * Yes, the list goes to 53! That’s because it includes DC, Puerto Rico (29th) and Guam (46th). Long story short: the most jobs for RNs – right now – may be in Texas, California and New York, but the highest concentration of RN jobs is in a variety of smaller states like Missouri and Maryland, which usually but not always have an older than average population. What you really want to know, though, is not where the most jobs are now, but where the most jobs will open up in the next few years, right? Where will they be needing more and more Registered Nurses, at the steepest rate? When looking for the most impressive job growth for RNs, you can approach the numbers two ways. In absolute terms: where will the highest number of new jobs appear? And in relative terms: where will the number of RN jobs grow at the fastest rate? First things first: where are the most job openings expected to appear? We have a Top 10 ranking. And a map. Because whatever the question, the answer is always better with a map. Texas, California and Florida again stand out, which makes sense since that’s three of the four states where the most Registered Nurses work now, and where the most people live. Underperforming, however, is New York state. That’s because the number of RN jobs there is set to only grow by 13.4% between 2012 and 2022, compared with 19.4% countrywide. Which brings us to the relative terms: where is the job market for RNs expanding at the steepest rate? * I’ve bracketed the Virgin Islands from the Top 10 because, well, it’s just 10 jobs a year. Texas, near the top of the lists whether you look at total job openings or growth rate, stands out as a land of opportunity. (Even its First Lady is a former nurse!) Florida and North Carolina feature in both lists too. Otherwise the list of states with the highest growth rates is heavy on states in the Mountain West. Utah, Idaho, Colorado, and Montana are all there. So is Arizona. Go West, young RN! Some of the states with the highest density of RN jobs now will see the smallest growth: South Dakota, West Virginia, Missouri, Maryland. But so will some of the places with the lowest density of RN jobs (Virginia, DC). On the bright side: with the exception of Illinois and Maryland, even in these states the development of the labour market for RNs exceeds the growth rate of total employment in the U.S.
Texas, near the top of the lists whether you look at total job openings or growth rate, stands out as a land of opportunity. One final piece of the puzzle: where do RN jobs pay best? The short answer is: on the West Coast, and in far-flung states like Alaska and Hawaii. But that’s only the beginning of the question. Because what good are high wages if the rent’s too damn high? So figuring out where working as a Registered Nurse makes for the best deal has to involve comparing wages (mean or median, hourly or annual – take your pick) with cost of living measures, which differ a lot within states as well as between states. The Bureau of Labor Statistics also suggests another interesting measure: wage differentials. How does a Registered Nurse’s salary compare with the average kind of wage workers in that area earn? Nation-wide, a RN earns about 1.5 times as much as the average worker, but in Modesto, CA, for example, it’s almost 2.5 times. Then again, if your pay as RN looks good just because your fellow residents are relatively poor, is that a good thing? Take Brownsvile—Harlingen, TX, “where the average RN earned $66,480” in 2013. That was more than twice as much as the average worker there; but in an area where the median hourly wage is $10.81, that’s not necessarily saying all that much. Stay tuned, because in a follow-up post, we’ll dig in! Meanwhile, of course, don’t forget to check our site for newly available jobs for Registered Nurses.